Google is showing answers in the search results without showing any organic listings or ads or anything but the answer. 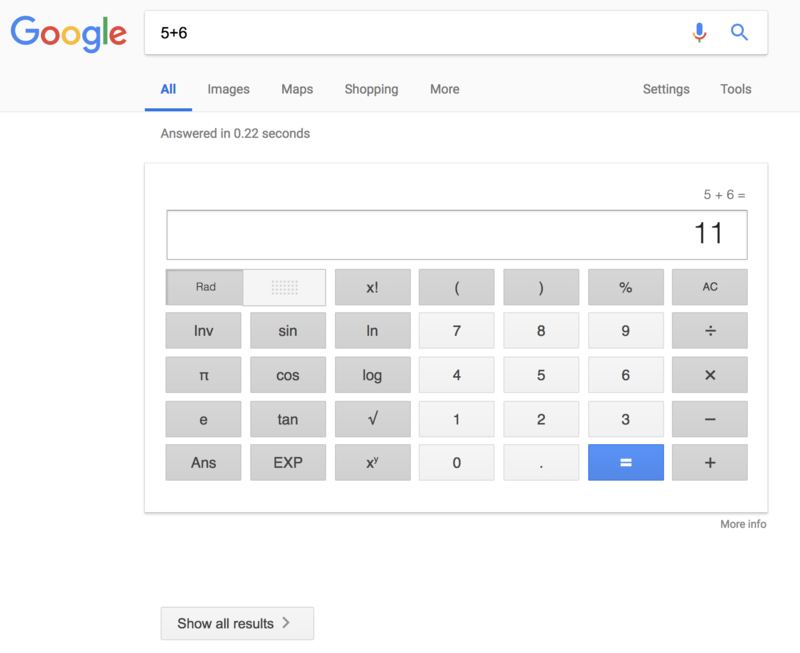 Yehoshua Coren posted on Twitter a screen shot of him going to Google and Google returning the answer and a button to show search results. 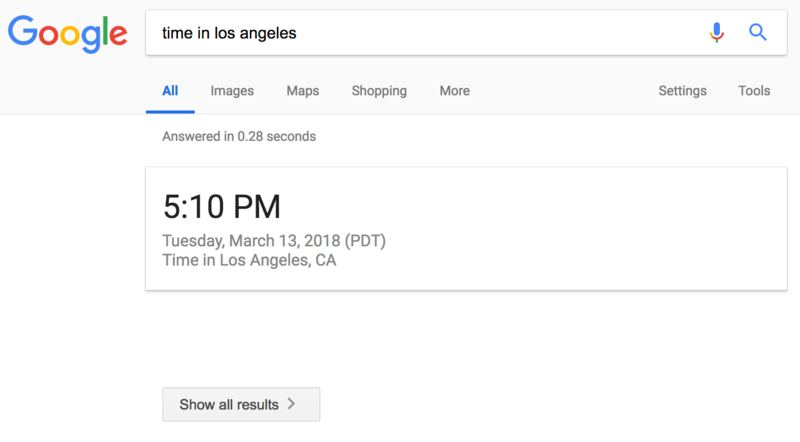 He searched for [time in los angeles] and Google is only showing the answer with a button later on to "show all results." How about that, Google not showing any search results for a search query. Danny Sullivan of Google confirmed it and said on Twitter that this works for searches that bring up the "calculator, unit converter & local time." Google said they are "experimenting with a condensed view to further speed up load time." 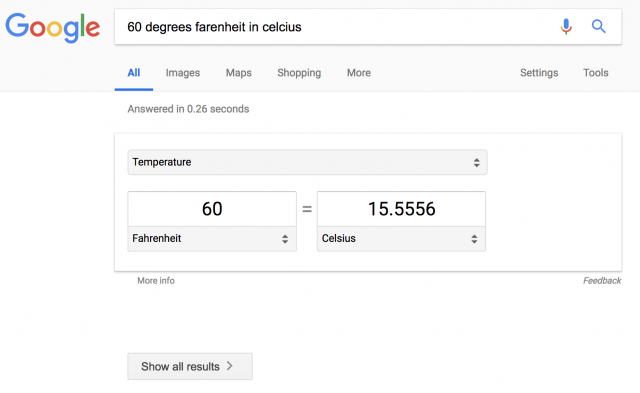 Google said that searchers "rarely use the full search results" for these types of queries and if they want it, they can click the "show all results" button. My understanding is everyone will see this experiment. As it's an experiment, it might not stay. But initial testing was strong enough for the broad rollout. Playing Devil's advocate slightly (and I think your question is a fair one), there aren't any ads, either. I'm honestly not sure how hiding organic and ads would materially benefit Google. The results are still there for you or any of the few who actually use them. Push the button. Time and date, I'm OK with. Stealing data and blurbs of text from other websites to answer questions, and eliminating the need to click thru to them, not so much. I think it makes sense too, but where do you (Google) draw the line on when an answer is the only thing you need to show? Sorry, this is the direction of things with Google. Display more and more culled information on first page (with ads), search results will be on 2nd page. The real estate has been shrinking steadily for search results. Where is the 'opt-out', 'down vote', 'feedback' link? Noted. It is still considered an experiment. It was tested & confident enough for a full rollout. Google will be watching closely how that goes and I'm sure make any changes that seem an improvement.